With Louisiana’s devastating floods affecting tens of thousands, New Orleans native chef David Guas is cooking up a way to help. Starting from a young age, Guas’ beloved Aunt Boo inAbbeville, LA taught him the fundamentals of his native cuisine starting with a roux and working up to iconic dishes like Shrimp Creole. 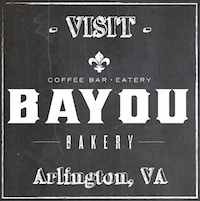 Now, with Aunt Boo’s home flooded with over two feet of water and her Abbeville neighbors reeling in similar predicaments, Guas will serve up a $9 appetizer special of Shrimp Creole for one week starting Friday, August 19 at Bayou Bakery, Coffee Bar & Eatery in Arlington, VA and Washington, DC [every day except for Sundays]. With every order, 50% of the proceeds will go directly to Aunt Boo and those in her community who are suffering in the wake of this natural disaster, many of whom did not have flood insurance. Aunt Boo’s daughter, the Louisiana based designer/artist Ellen Macomber, is donating proceeds from her handcrafted Louisiana tote bags and pennants to help her mother and neighbors get back on track. Visit www.ellenmacomber.com to shop. Those outside of the DC area can still lend a hand toward the rebuilding of Aunt Boo’s home through GoFundMe by clicking HERE.